The struggles for African Americans are deep, long and ongoing. Please take a moment to read about a North Carolina couple’s fight for Equality under the Law here. Minorities of all stripes recognize both the struggles that African Americans have faced in gaining Equal Civil Rights, but also the need to press forward for the full and complete relief from all remaining subtle and systemic forms of discrimination. History is not yet finished. As a white man, I understand the freedom from many sorts of discrimination that I enjoy as opposed to my African American brothers and sisters, and I also understand the need to be perpetually questioning of my own self as to whether I am participating, albeit in unintentional ways, in the subtle discrimination of others. I do not have to be African American to understand discrimination. And conversely, can’t African Americans know the discrimination experienced by other minorities? Of course. We have all heard of the term “white privilege”. And while there is validity with the general intent of this statement, I will say the same thing, but in the exact opposite way. Follow me. I do not think that what white people enjoy is “privilege”. This freedom from oppression is what all people should enjoy. And so I would say it another way, and that is, that African Americans have been, and still are, “under-privileged”. This is the more accurate description as the situation currently exists. How in the world, I ask myself, if I am expecting fair and equal treatment under the Constitution, can I then turn right around and discriminate against others under that very same Constitution? How can I ask others to wait longer for full equality? How can I say that another person should not be “too pushy” in gaining their own rights [as has been literally said to me]? How can I be silent in the face of the substandard treatment that others experience? How can I reject the mere company of others and not accept them into the community of mankind? We must all share in the qualities of our collective success or we cannot thusly claim the mantle of fairness. Man can fly to the moon, cure cancer, and speak electronically in real time, and in opposing languages, to people on the opposite side of the planet, but if these successes are only selectively endowed to some people and not others, if we are not taking everyone along on the venture toward success, can we really call it “success”? Today, and I am sure tomorrow, we must all continue to push forward to gain the full and complete equality under the law for all citizens, and for the visitors to our nation, as is guaranteed by the Equal Protection Clause in the Fourteenth Amendment of the U.S. Constitution. On this we cannot be complacent. 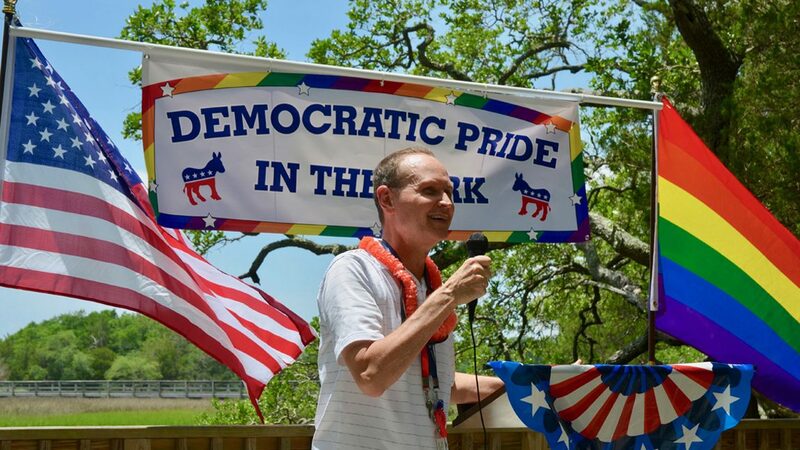 Stefan Varner, chair of the Myrtle Beach – Horry County LGBT Committee, speaks at last June’s Democratic Pride in the Park picnic.